The BNP has said it is offering people the chance to vote for "common sense" policies, as it launches its English local election campaign. The party is fielding candidates for councils in England, and the assemblies and parliaments in Scotland, Wales and Northern Ireland. 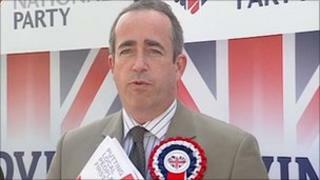 Deputy leader Simon Darby said the BNP "will not be intimidated" and accused "the state" of trying to shut it down. But he was heckled at the launch of the English campaign in Stoke-on-Trent. Mr Darby said: "This follows on from a successful launch yesterday in Wales and Northern Ireland, within the next couple of hours there will be a manifesto launch for the Scottish Assembly as well, making us a very British party - we are a British nationalist party." "We will not be intimidated by the state who have recently tried to put us in prison, they deny us venues, they shut down our credit card processing facilities. They are doing everything they possibly can to stop the British people having a proper democratic choice in this election. "But they are not going to win because right across this country more and more people are having the chance to vote for us - for common sense policies." He criticised mainstream parties and said the BNP "believe in what we say". "When we say we are going to stop immigration that is exactly what we will do." The anti-immigration party has been engaged in a long-running court battle with the Equality and Human Rights Commission (EHRC) over its policy of restricting membership to "indigenous British people". It scrapped the rule but the EHRC accused party leader Nick Griffin of failing to comply with an order to remove potentially racist clauses from his party's constitution. In December Mr Griffin fought off an attempt to have him declared guilty of contempt of court at the High Court - which rejected the EHRC's bid to seize the party's assets. And a BNP candidate for the Welsh Assembly elections was charged with a public order offence this month, after being accused of burning a copy of the Koran. Figures collected by news agency the Press Association suggest the party is fielding 268 candidates in England. The party has two MEPs - elected in 2009 - but lost almost half its councillors in last year's local elections. In May 2010 Mr Griffin announced he would step down as leader in 2013. In February it registered for the first time as a political party in Northern Ireland, allowing it to field candidates in Assembly and council elections. Meanwhile the opposite sides of the campaign to change the UK's voting system continue to clash over whether the Alternative Vote would benefit, or damage, the BNP. Lib Dem Deputy PM Nick Clegg said on Sunday AV would "snuff out extremism" - while Tory co-chairman Baroness Warsi argues that, as AV is a preferential system, supporters of "extreme parties like the BNP" would have their vote counted more than those who back mainstream parties.